This Hill Fort was once used by Faeries to store the grain that they gathered from the surrounding plain. The Faeries were driven away by the sound of the newly erected Church Bells nearby. They left so quickly that they didn’t even remove the gold from the hidden passageways beneath the mound. The Faerie treasure can not be found by mortals for the harder you dig for it the farther it will sink into the earth of Cadbury Hill. Glastonbury is a place that is oozing in spiritual and mystical energies, it is the Isle of Avalon, the faerie island where the dying Arthur was taken. Many years ago it was an actual island in the midst of the marshes of Somerset until the drainage programme initiated by the Abbots in the 13th Century. The Tor is topped by St.Michaels Tower, this particular Saint protects sacred sites by standing to the North of the buildings. At the base of the hill is the Chalice Well, this is where the Holy Grail was hidden by Joseph of Arimathea and then found by the Knights of the Round Table. The water from this well has special healing powers and is drunk by the hundreds of pilgrims to this magical site. There are two further wells, one to the north west of the Tor, the Elder Well (also called St.Edmunds Well) which used to be surrounded by a sacred grove of trees, and nearby to that again, Ashwell Spring. The entrance to Annwyn, faerieland on Glastonbury Tor is guarded by Gwynn-ap Nudd, The White One, the Faerie King. His Crystal Realm is the meeting place for the dead and from the Tor he leads the Wild Hunt on Samhain, on stormy nights he is accompanied by the White Hounds of the otherworld. Around the 1400s a welsh saint called Collen built himself a hermit hut on the lower slopes of the Tor. The saint wished to meditate in peace and at that time the Tor was still an island surrounded by marshland so it was an ideal retreat for him, or so he thought, he didn’t realise that the Tor was already occupied by Gwynn-ap Nudd and his court. One day he overheard two locals talking about the Faerie King and was furious with them that they could still believe in such old superstitions. The two men warned him to be careful of what he said of the King, as his wrath could be terrible. Collen refused to listen to their warnings and returned to his meditations. The next day a faerie messenger appeared at his hut inviting him to a meeting with Gwynn-ap Nudd at the top of the Tor. The same messenger returned day after day until Collen finally agreed to meet with the King. But before following the messenger to the top, he slipped a flask of holy water inside his cloak. As he reached the top, the familiar landscape of the Tor disappeared and there were the faerie halls of Gwynn-ap Nudd gleaming with sparkling lights and filled with beautiful music. The Faerie King himself was seated on a golden throne at the end of a vast hall surrounded by his courtiers. He welcomed the welsh saint warmly, offering him a drink from a beautiful golden cup, but Collen knew enough of the faerie ways to refuse the drink. He took the flask of holy water from his cloak and with a sweeping gesture threw the water over the company of faeries. 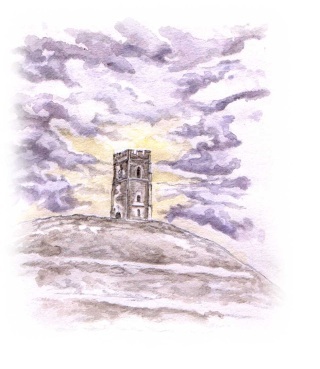 Gwynn-ap Nudd, his faerie palace and courtiers all disappeared leaving Collen alone on the top of the windswept Tor. But the Faerie King did not disappear forever. He is such a powerful figure that he still remains at the Tor, guarding the entrance to Annwyn.